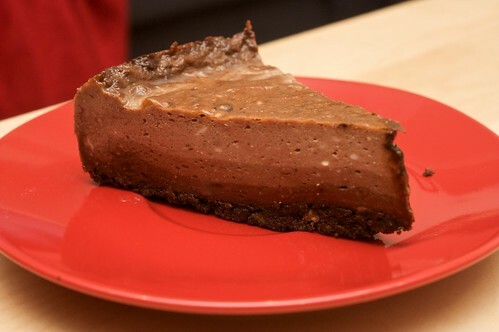 This chocolate cheezecake (from My Sweet Vegan, pg126) was so incredibly rich, if you look at the photo you can see where the vegetable fats started to separate. I think our oven was too hot (it often is), or the cake didn't need quite so long, because it was a little over cooked. Although it has three layers, it was not overly complicated or time consuming, though I did have to do a lot of mixing. Hooray for the Bamix! I didn't make many mods - I used Nice biscuits, like I usually do with cheezecake, and I'm not positive that I used granulated sugar (often I use caster sugar instead). It was so rich, I refused to eat it later in the week. Next time I make this, I will a) allow myself more time (it was still warm when we went to eat it a few hours later), and b) use the leda chocolate tim tam things, in order to make it gluten free. I really like My Sweet Vegan, I've made some delicious things from it. Highly recommended! Danni and I are both a little bit obsessed with scones at the moment, so in the last couple of weeks we have both turned our hands to baking scones, using the same basic scone recipe. 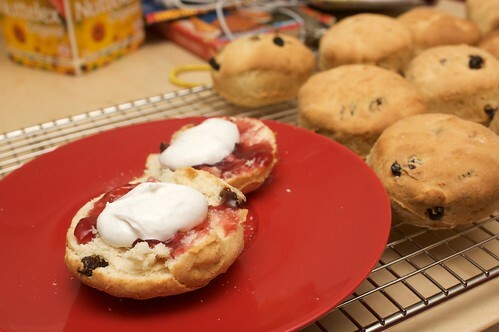 Above is a photo of my scones, which were the first attempt. Happily for me, it turns out that Danni's scone baking skills are far superior to mine - happily because it means whenever we want scones it is Danni who has to exert the effort. Hooray for laziness! The scones pictured here were served with nuttelex, jam, and soyatoo cream. Oh yeah. A few weeks ago we made baked potatoes for the first time in a while, and it was pretty exciting! We flustered around the kitchen, and made some mistakes, and ended up with some delicious potatoes for dinner! 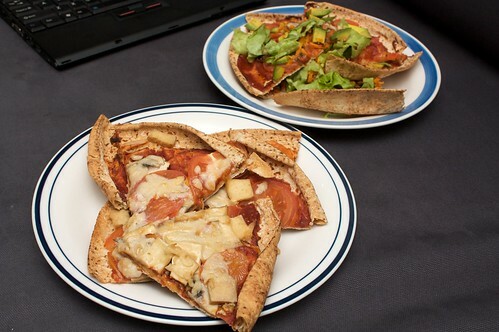 Recently, I went to class and left Danni (and Jo) in charge of dinner, and a decision was made to do it again, but with a twist - nacho toppings! It was BRILLIANT. For inside the potatoes, Danni fried some cumin, paprika, and chili flakes (lots) with some tomato sauce, then added some refried beans and about a third of a can of diced tomato. This simmered on the stove for about fifteen minutes. The potatoes were then topped with grated cheezley. This concoction was then wrapped in alfoil and baked for about fifteen minutes at 180C. In the meantime, Danni made our usual red bean and rice mix. This was served on the side of the potatoes, with a little guacamole. Despite living less than a fifteen minute walk from vege2go, before last week we had never tried their food! So when the opportunity to sample their wares in the company of Kristy and Toby arose, we took it. 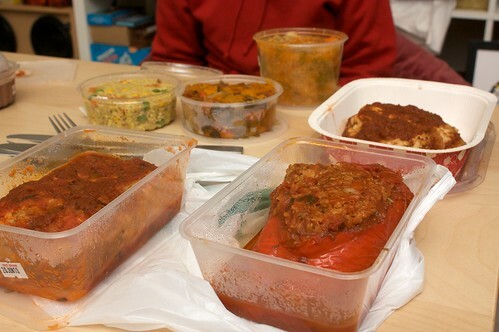 Because I had heard around the place that vege2go now no longer does dine in, we ordered a takeaway. But Kristy and Toby reported back that there were people dining in! So now I don't know. If you have heard either way, please let me know! Anyway, vege2go is all vegetarian, and has a range of vegan and gluten free options. Danni and I decided to pick two dishes to share, going for the lasagna and the quinoa casserole. The lasagna was excellent, had a great taste and texture, nothing too overwhelming or bland. I would definitely eat it again. The quinoa casserole (gf) was a bit bland and uninteresting, and there was something about the combination of quinoa and vegetables that I didn't like. Not a repeat for me. Kristy ordered the stuffed capsicum (gf), which was filled with rice and some sort of sauce. This (which I sampled) was pretty good! And now I'm on a bit of a stuffed vegetable roll. Toby went for the vegan parmiggiana. Not as good as the EBC parma, he declared, but still good. We shared two sides, the roast winter vegies and the Mediterranean rice salad (both gf). The roast vegies were excellent, and there was something about them that I'd love to replicate. The rice salad was not great, Kristy insisted it tasted like cat pee, which is hardly a recommendation. Finally, Kristy and Toby decided that we needed to splurge on dessert. The tiramisu, about which I've heard a lot, was delicious (and I don't like coffee). The chocolate mousse (gf) was good, and interestingly gooey. All in all, would try again for a takeaway dinner, but nothing spectacular. Sometimes, people other than Danni and I cook in our kitchen! Or cook for us! This is always pretty exciting, because my joy in cooking stems from my joy in EATING, and having someone else cook for me combines two of my favourite things, eating + sitting around, with the added advantage of when people cook in my house, it becomes eating + lounging around in my beanbag. About two weeks ago (it has been too cold to upload photos, okay?!) Jo decided to cook us a two course dinner. It would have been three courses but by the time we got to the end of savouries we were too full for sweets, but that is okay! We started with some roasted pumpkin soup. This was super delicious, and looked pretty easy, from my position on the couch. This was followed up with some garlic bread (using up some leftover sour dough we had), and made using roasted garlic and olive oil. The garlic was roasted with the pumpkin, and then squirted out onto the bread. It made the house (and the bread) super garlicky! 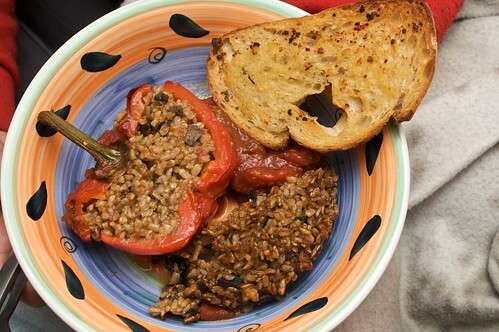 We ate the garlic bread with stuffed capsicums and stuffed field mushrooms. 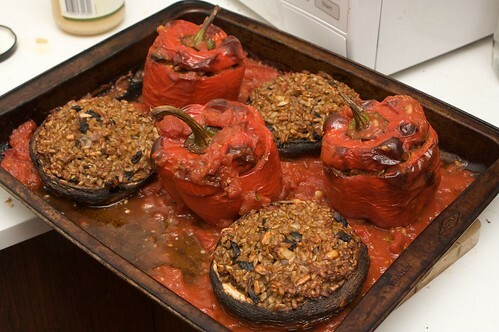 The stuffing was a brown rice mixture, and I love stuffed vegies and never have them, so this was exciting! And delicious! The roasting pan was lined with a layer of a tomato mixture, kind of like a pasta sauce, with squished tomatoes and some herbs in it. This layer of tomato deliciousness was mixed in with the risotto later, for nomming. This is really easy and really delicious! Recipe by Jo, vaguely remembered by Danni, artistic license by me. Cut the pumpkin in half (or in pieces), and roast it until it's very soft. I like to go for about 200C for about 45minutes. Remove the skin, and allow to cool. 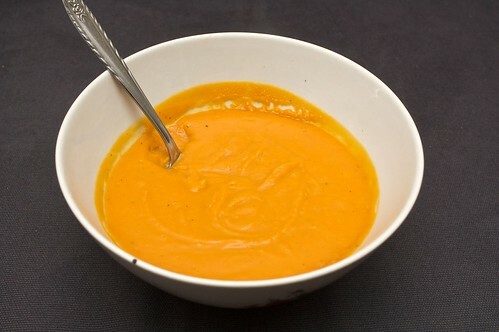 In a blender, blend together the pumpkin, cumin, nutmeg and the salt, with a little bit of water to help in blend. 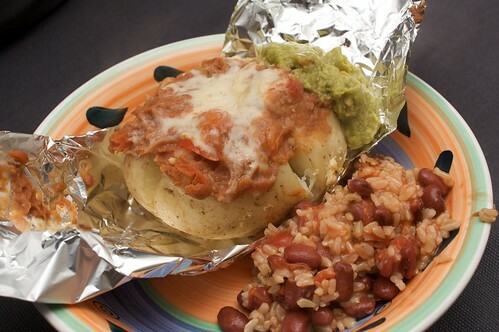 Reheat (on the stove or in the microwave, whatever is your preference), and serve. OH YEAH. 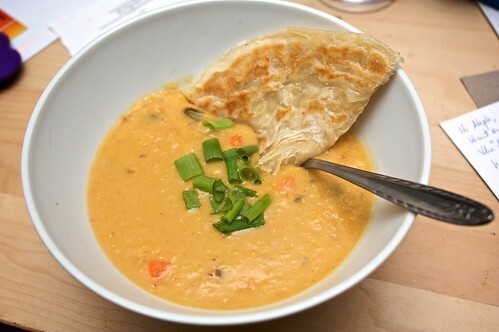 This lentil soup recipe from 101 cookbooks is so delicious, we've made it three times in the last month! It's a really easy recipe, with not a lot of prep, though it does take a bit of time to cook. Every time we make the recipe, we modify it a tiny bit more, so I'm going to post the recipe below with our mods, and come back to make more notes every time we make a change. They're only little changes, just tweaking to our tastes, but it's worth it. I like to serve this with fresh roti, but toast or bread also works fine. I'll be honest, by the time we're done with it, it's basically dahl as soup, but I'm okay with that. Because it's delicious! Soak the lentils in some cold water for a while, about twenty minutes. Rinse them, then in a big pot, bring them to a boil with the stock and the water, plus the carrot, potato, and half the ginger, then simmer with the lid on until the vegies are soft, about twenty-five minutes. In a fry pan, saute the curry powder, cumin and coriander for thirty seconds, carefully not burning anything, then add the nuttelex, tomato paste, and half of the spring onions. Fry them all together for two or three minutes, stirring constantly, then remove from the heat. It should smell delicious! Add this all, along with the coconut milk, to the lentils, after the twenty-five minutes of simmering. Continue to simmer, this time with the lid off, for another fifteen minutes. Then add the cherry tomatoes for about five or ten minutes. You can modify the thickness with a little more water if you require it. Serve with the remaining spring onions, and roti or something delicious. Our friends (occasionally referred to on this blog as melbourne squids) recently moved into a house that is a mere eight minute walk from the house of penguin. On the morning of their moving in, we walked down to help them at the unloading stage, and then invited everyone around for tea and polenta cake. This was my first attempt at polenta cake, I elected to go for a lemon polenta cake because that is Amanda's favourite type. 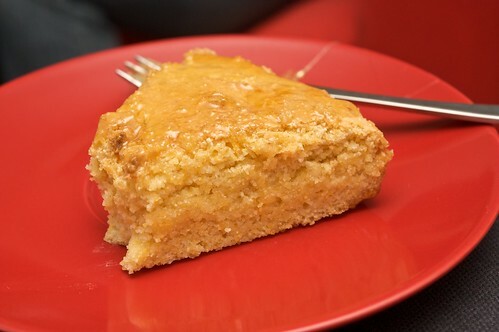 It was an interesting texture, and drizzled with a lemon syrup that quickly became like toffee on top of the cake. It was very tasty! In a bowl, combine the flour, baking powder and polenta. In a separate bowl, combine apple sauce and half a cup of sugar, and beat well together (I used a fork), then combine the vanilla essence and the lemon rind. In a third bowl, beat the egg white replacer with the remaining sugar until stiff. Lightly combine with the apple sauce mixture, then fold into the first bowl. Mix until just combined. Grease and line a round pan, and pour the batter in. Bake for 30 minutes at about 160C. To make the syrup, over medium heat, constantly stir caster sugar, lemon rind and lemon juice, for about ten minutes, until it starts to thicken. Poke holes in the top of the (still warm) cake, and pour the syrup over the cake. Eat before it solidifies. Danni and I have become quite blase about our home made pizzas. As spectacular as some shop pizzas are, we think we've got our technique, style and flavours down pretty well; we know what we like and how to make it, and we've been pretty happy with that. Recently, due to a dearth of ingredients, we made a couple of new combinations, and one, in particular, was so tasty we were sad they weren't all that pizza. We didn't even have pizza bases for this - our pizza dough failed to proof, confirming some suspicions we've had for a while now, that our yeast has gone bad (it says best before August 09). Fortunately, we had some pita bread floating around from Danni's lunch, so we decided, reluctantly, to utilise those instead. This meant that we reduced the baking time and temperature (down to 150C for 15 minutes), and the bread was still crisp where it had no toppings. BUT OH THE TOPPINGS. On the pizza base, we added tomato paste, crushed garlic, and dried oregano and basil. 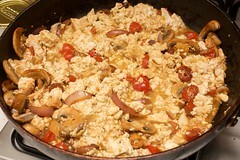 On top of this we placed thinly sliced roma tomato and button mushrooms, and then some chunks of smoked tofu. On the top we grated some Cheezly Mozzarella, thinly layered. IT WAS AMAZING. A smoked tofu pizza revelation, if I may. 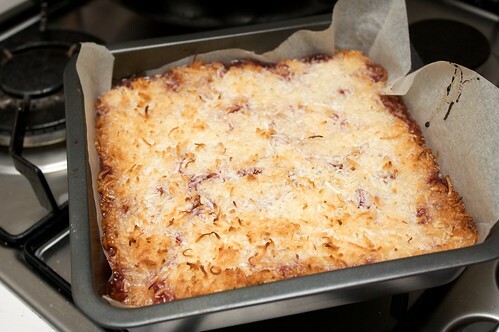 Coconut and jam slice is apparently an Australian Classic, but until I made it, I'd never eaten it. 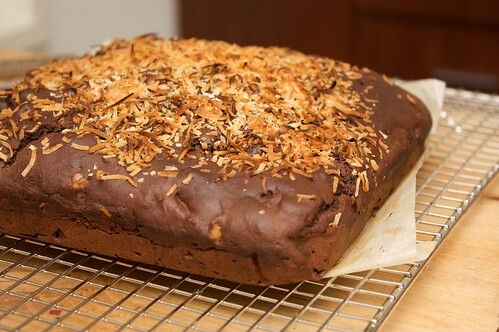 I couldn't find any vegans online saying they'd made it, and it seemed like such an odd recipe regardless, with a topping made entirely of eggs and coconut and sugar, but I was fascinated by the idea of it, and decided to give it a go anyway. This was my first try, and it was brilliant. When I pulled it out of the oven, I wasn't sure I'd done it right - the top was a sea of jam and coconut and apple sauce - but after it cooled and I sliced it, I bit into it and it was amazing. I've made it twice since then, both times gluten free: once for Miss T's birthday party, and on this recent Melbourne public holiday for afternoon tea with the Melbourne.Squids. 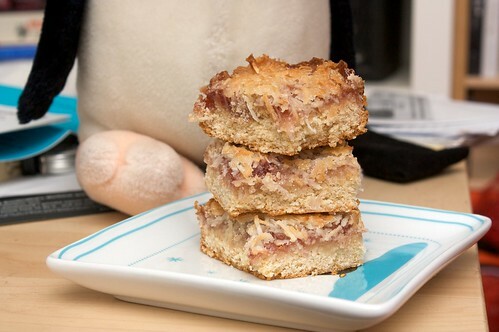 The bottom is a coconut cakey layer, followed by a thick spreading of jam and the soft, crunchy coconut layer on top. This was modified from here. Line a baking tray with baking paper. The tray should be about A4 size, though I used a slightly smaller square this time. Combine the flour with half of the caster sugar; then rub in the nuttelex until crumbly. Continue using hands to combine two spoons of apple sauce, then about 30g of the desiccated coconut. Press the dough evenly into the tray. Then smear the jam over it. I made my jam about 1-2 millimetres in height, but you go for what makes you happy. Make sure it's spread all the way across to the edges. Beat together the remaining ingredients (coconut, apple sauce, caster sugar). Distribute over the base + jam carefully, because you don't want to move the jam or anything. Bake at 170C (not fanforced) for about 30 minutes (I think I did 31). The top will be quite golden and crunchy. Don't put the tray on the top rack - you want it to cook kind of slowly, so keep it closer to the bottom/in the cooler part of your oven, if it has one. I love pad thai so much, that peanut deliciousness and rice noodles and vegetables. It is a great way to eat noodles! Sadly, it is a noodle dish that I have so far failed to replicate at home. We've tried many different methods: using peanut butter; crushing peanuts; mixing together so many different sauces. We've tried cheater methods and long-form methods. We've tried recipes from Thai bloggers and recipes from people who claim their recipes are so totally wrong but so totally delicious. Still, so far, giant failure. 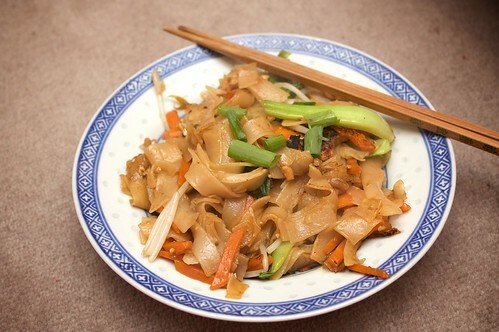 Is it because we'll never replicate pad thai without fish sauce? I hope not, because that means the pad thai we get from our local is not suitable for us, AND the cheerful man there lied to me. This one was okay, but still not quite right. 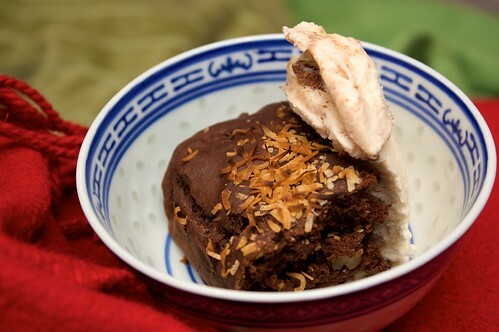 Check out this chocolate + coconut brownie! Doesn't it look great? Here it is again, served with Tofutti Better Pecan icecream. Oh yeah ice cream. Shame this brownie was not good at all. It was dry and nowhere near chocolate-y enough. SADFACE. I have yet to successfully make a delicious vegan brownie. So please feel free to recommend recipes to me! I (and Danni) would really appreciate it! I don't know anything about this ad campaign (because I...don't watch TV in Europe...), but I still am horrified by what is going on here. A report at the Daily Mail: Meerkat misery: Thanks to that TV ad, they're now a must-have pet…but behind the cute image lies a shocking cruelty. This is an article about meerkats becoming pets, being kept as single meerkats, in small cages, all sorts of horrible care issues. Mohd Ali had on May 28, during a meeting with his Facebook friends at The Curve, Kuala Lumpur, said God created animals to be used by humans, including to be eaten and animals needed to be sacrificed in order to find vaccines and cure for diseases. Miss T has a post up about Animal Justice Party of Australia. About dairy milk: World Milk Day or Weapon of Mass Destruction? I plugged toy camera (an IXUS 55) in to download some photos, only to discover there's photos on there from a month ago! Early in May we adventured over to Hawthorn not, as we usually would, for Plush Pizza, but to try out the noms at the Penang Coffee House on Burwood Road. I had been really looking forward to this. 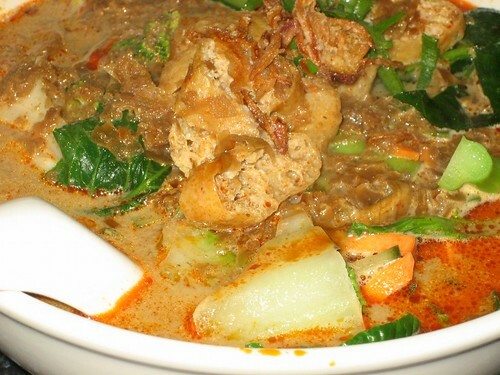 I'd heard it was cheap, and that there was vegan laksa available, and I am still on my quest for a good restaurant laksa suitable for vegans here in Melbourne. If you have any recs, please share them with me! Anyway, Penang noms. Oh Penang, love of my heart, with your hawker foods and your strong Hokkien influence and your delicious fun times. At Penang Coffee House, I found and located the laksa, and refused to share. It was not that great. I mean, it was a perfectly serviceable noodle soup, but it was a bit bland, and not at all spicy. The noodles, curry and tofu that Danni and Jo shared were much better. The sayor loday had a rich flavour, and the stuffed tofus were fresh and delicious, and the noodles (I think a mee goreng) were tasty but a bit lacking in wok hei. Despite my laksa disappointment, I would give Penang Coffee House another go; in fact, I plan to order takeaway tomorrow. ETA: well, I am eating my lunch now, and I just remembered another thing I didn't like about Penang Coffee House: THERE IS PINEAPPLE IN MY NOODLES. I'm out. Danni and I are somewhat new to the world of scrambled tofu. 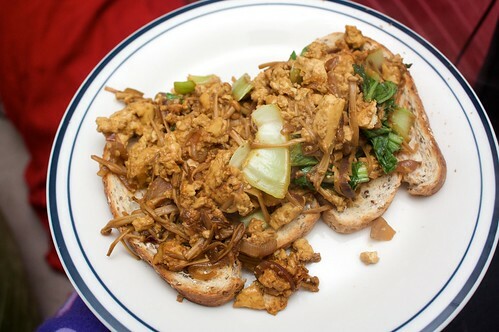 Although we'd tried it one or two times in Perth, and although I come from a tofu family,* scrambled tofu didn't feature very high on our rspective radars, and it wasn't until we came to Melbourne that we really mastered the art of scrambled tofu. 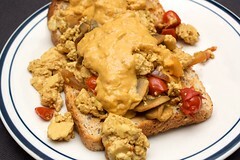 Scrambled tofu is an easy way to use up leftover tofu, and I take advantage of this to make scrambled tofu (or fuscram) about once a week. Also, it's delicious. It's important to use firm tofu for fuscram, though I have on occasion used a soft tofu, just because that's all I've got in the fridge. 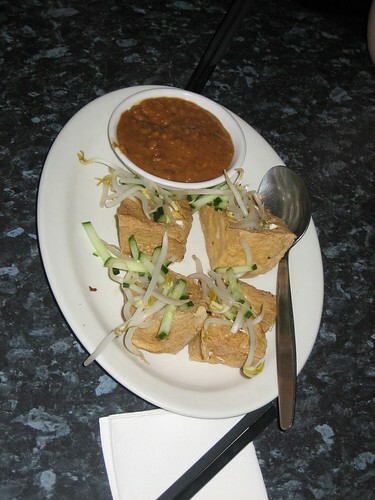 Carla has a brief tofu post here if you're unfamiliar with the different types of tofu. 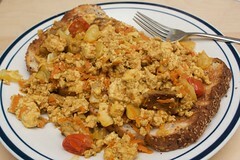 Although scrambled tofu is a sort of instead-of-scrambled-eggs thing, you can't just scramble the tofu on its own. Tofu is really versatile, but it doesn't have much flavour on its own - you have to add things to it. I like to use up whatever veggies are in my fridge, my favourites are tomatoes (preferably cherry tomatoes), spinach, grated carrot, red onion sliced skinny, and golden boy mushrooms. Not necessarily all at the same time. The combination of herbs and sauces that I use also varies. My favourite combination is dark soy sauce, cumin, tumeric, nutritional yeast/savoury yeast flakes, and kala namak/black salt (which is pink!). I also don't mind a nice pesto combination, when I've got some good looking spinach or basil leaves in my garden from which to make some pesto. I do try to match flavours - a recent scrambled tofu contained bok choy and golden boy mushrooms with lots of soy sauce; this morning's was cherry tomatoes, shallots, and a tiny drop of dark soy with nooch and kala namak. Sometimes there's chillis involved. I've also been known to add marinated things - I marinate and cook tempeh first, then put it aside to cook the fuscram, and throw it in at the end. This is a good way to use up some leftover tempeh, or to add some extra flavours and textures and nutritional elements to breakfast. This is my generic how to scramble tofu: start with the vegetables, in a general cooking order, as well as the condiments. You want them to be mostly to totally cooked before you add the tofu. Drain the tofu! Some people also pat the tofu dry, or at least a bit drier. Add the tofu to the pan, and thoroughly break it up/scramble it. Big chunks of tofu in your fuscram will be largely bland and unflavoured, and that's no fun when you're looking for a flavoursome fuscram. Make sure it's totally mixed in with your condiments and veggies - you may want to add more, depending on your tastes. This is totally a what is your preference sort of thing. If I'm making toast, on which to put my fuscram, I'll start toasting about now, because I have to do four slices. By the time the four slices are done (in two lots, about seven minutes), the tofu is ready to nom! 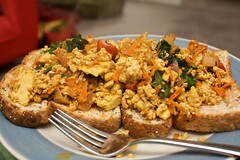 I ♥ scrambled tofu (and have previously and more specifically blogged it here). Planet VegMel is growing as we find (and collect) more Melbourne Veg*ns! If you are lurking, come join us! We had some lemons floating about in the fruit bowl, and some cream cheeze sitting in the fridge, and Saturday night was cold and I was feeling grumpy, so I decided that some baking was in order. I wasn't sure how this cake was going to turn out, because I sort of smushed together a few recipes and hoped for the best, but this was good! Kind of dense but not too heavy, and the flavour was just right. I just had a piece for morning tea, and it was a delight! In a small bowl, combine the soymilk with the lemon zest and juice, then leave to sit for a couple of minutes. In a bigger mixing bowl, sift the flour, salt, baking powder and baking soda. Then, add the sugar, oil and apple sauce to the milk+lemon mixture, and whisk together until well combined and the sugar has dissolved. Pour it into the dry ingredients, and mix together until the batter is smooth, but don't go all out with the mixing. Pour the mix into a large tin that you have prepared by greasing or oiling. Then bake at about 175C for about 45 minutes, or until cooked through. The top will probably go a bit golden, this is okay. 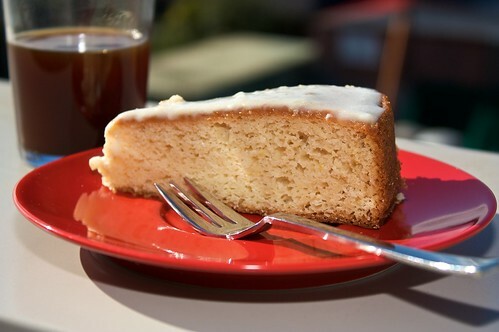 Let the cake cool for ten or fifteen minutes before you put it on the baking tray; let it cool completely before icing. For the icing: Combine zest, juice, cream cheeze and icing sugar and mix well. Allow to rest, then pour it all over that cake. Eat it as soon as you can. It's delicious, and it's still delicious the next day.